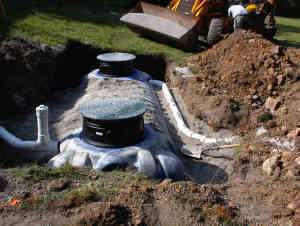 Design, maintenance, repair and installation are all part of our septic system services in Springfield, MO. Understanding what type you need or are required to have by Greene county is a solution we can provide. This is a question we often hear when working for clients who have recently moved from metropolitan communities to more remote or rural areas in Springfield. For more information on our services visit this post for the Types of Septic Systems we Install in Missouri. Interestingly, many clients consider being on a septic system a bad thing compared to being on city or community sewer systems. The truth is a properly designed and maintained septic system is one of the best sewage treatment systems available. Unfortunately, many homeowners do not realize the importance of maintaining their septic system. It is out of sight and out of mind until a problem such as a sewer backup develops. One of the biggest reasons homeowners do not properly maintain their systems is because many are not designed and installed with maintenance or preservation in mind. Many homeowners have no idea where their septic tank, lateral lines or disposal field are located. Many systems have little to no access openings to grade which allow for easy servicing or inspecting. Additionally, proper design and installation procedures are often ignored either through ignorance, disregard or both. The only maintenance some systems ever receive is having the septic tank pumped after a sewage backup. People overlook the fact that just pumping the septic tank is not the only maintenance required. In fact, in many cases it can be detrimental to your overall system. At Envirotek Systems we have expertise in the design, installation and maintenance of all types of septic systems from conventional systems to advanced treatment systems. We also have solutions for restoring failing septic systems in Springfield, MO. Our proprietary methods offer immediate relief of system backups and surfacing effluent in your yard. Our services will protect your system from premature and unnecessary failures. We can often easily locate your system components with little to no excavation required. Our technicians keep abreast of the latest designs and treatment methods through continued education and research. We strive to continually develop innovative and logical methods, products and procedures that improve the performance and life expectancy of your septic system.